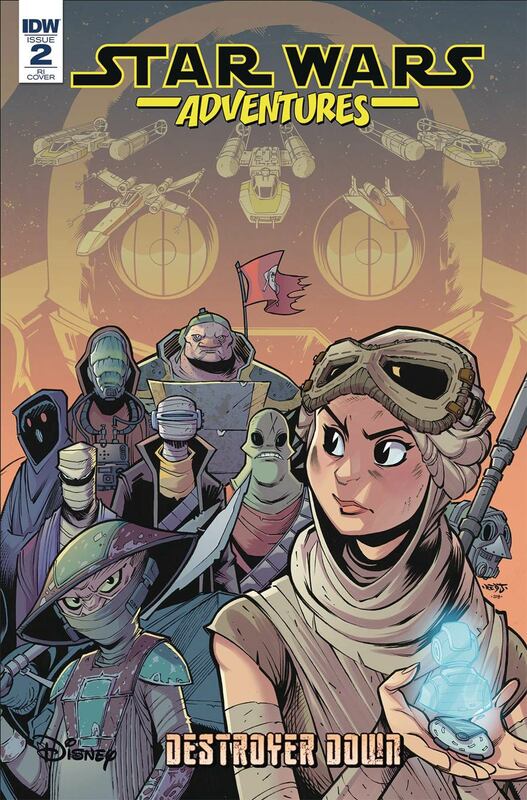 IDW’s Star Wars Adventures: Destroyer Down #2 follows Rey as she scavenges for the wreck of a legendary lost Star Destroyer recently uncovered on Jakku. The secondary story is set decades earlier and titled The Ghost Ship. It interweaves an account of how the ship came to be buried in the desert planet’s dunes. This is the middle act of Destroyer Down and the issue succumbs to a few pitfalls that come with the territory. It still can’t shake the rushed pace of its dual-story format, but it manages to stay on course and maintain suspense leading into next issue’s final chapter. The first story is still ambling along without much purpose, but the secondary has picked up enough steam to shoulder the bulk of this chapter’s intrigue. In Rey’s tale, the trio of goons (who felt like unnecessarily added stakes in the last issue) have had their roles better brought into relief — more as bumbling fools than as the bloodthirsty killers they had seemed. This refocusing is better aligned with the rest of the story and the dangers are more fitting for this all-ages treasure hunting tale. Rey’s personality isn’t quite what you remember from the movies, but if anything she has more personality and youthfulness here. My favorite aspects of the first issue were the expansion of Jakku’s history and the further detail given to the planet. Those aspects can still be found in a quick-nod sort of way, but they’ve become diminished in this issue. The fantastic, eloquent narration returns — near the end of the chapter this time — detailing all the ways one could die on Jakku. It might not be as effective as it was in the introduction of the first issue, but its written well enough to forgive the terrible pun that follows it. The secondary story - The Ghost Ship - is the more compelling of the two this time around. I was pleasantly surprised that this story — rather than a relying on a single thread to connect the ship of the past and its current state of ruin — is continuing to intertwine with Rey’s as she makes new discoveries. Each one prompts a flashback in the second section that details how the events unfolded and where all the pieces came to fit. Derek Charm’s vivid, colorful art style is poorly suited to the amount of darkness necessitated by the story this week as Rey and the thugs attempt to navigate the unlit wreckage of a half-buried ship. The opening pages are messy and cluttered, with bright purple emergency lights and (far too many) sound effects littering a jet black background. It’s enough to give you a headache. Throughout, the issue could have used a simpler, clearer layout. But the secondary artists continue to impress with a more textured, detailed riff on Charm’s cartoonish style which adds grit to better match the story’s writing. Destroyer Down #2 continues to provide plenty of all-ages entertainment and intrigue. It improves on a few of the first issue’s shortcomings but provides some more of its own in turn. There’s still not enough room in the pages for these stories and I miss the worldbuilding of the first issue. The tradeoff is a more focused forensic tale, and I can’t wait to see what Rey uncovers next.